On behalf of Admin of JML Law, A Professional Law Corporation posted in Bus Accident on Monday, Jul 09 2018. Buses are fairly common in cities. They transport students, commuters, or even people going on long-term trips. Bus accidents happen every day. It can be extremely terrifying. When you ride a bus, you trust that the driver will operate it safely. This isn’t always the case, or sometimes things happen that are out of the bus driver’s control. Buses were involved in around 63,000 traffic accidents every year. That is a lot of people who may be injured. When you’re involved in a bus accident, it’s important to know what you need to do in the moment. Some things you need to do are time sensitive. It’s also important to know how liability may be accessed during this situation. involved in the accident. Again, this will help make a stronger case because of the evidence from eyewitnesses. Most people have a camera phone nowadays. It’s important that you take pictures and/or videos of the scene from different angles to help with your claim. These procedures are pretty standard for any type of accident you may be involved in. After a bus accident, an investigation must be made. There are several factors that may have contributed to the accident that would find the bus driver and/or company at fault. The first being that the driver was not properly trained or properly screened for employment. The second being the bus was overloaded or not properly loaded to begin with. If the driver was fatigued or under the influence, then they may be found at fault. One last case that may be used for liability is if the bus or equipment on the bus was not properly maintained. Getting into an accident on the bus can be scary. There are many people involved and you may have sustained injuries. 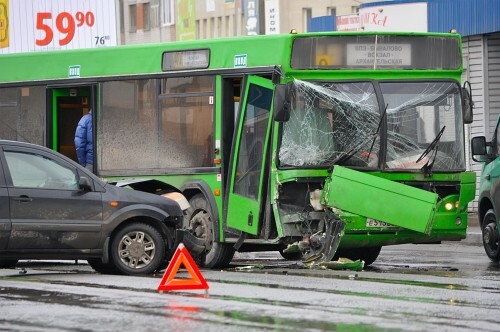 Bus accidents tend to have more victims and more serious injuries. It’s a scary situation to be in. You need Los Angeles bus accident attorney who is experienced in this field and will fight for you to get the proper compensation. JML Law, A Professional Law Corporation is here to help you fight for your rights and compensation. Call them today for a free consultation at 818-610-8800 or simply use this contact form.